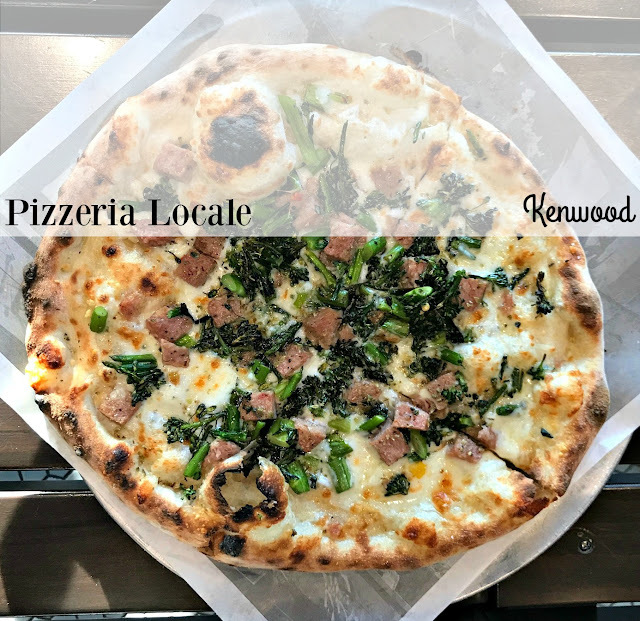 Restaurant Review: Pizzeria Locale - Kenwood | The Food Hussy! Recently I went out for a bite to eat with another soon-to-be blogger (@thedatenightcollection) and we decided to meet up at Pizzeria Locale across from Kenwood Mall. I hadn't been before but heard good things. They've also got a location in Mason as well as Denver and Kansas City. Pizzeria Locale focuses on fine dining and traditional Southern Italian food with a 900 degree pizza oven. They have some pretty serious wine chops in their leadership and also have a partnership with Chipotle. I have some thoughts to share about Chipotle - but I'll save that for a future post. This location is right across from Kenwood Mall in the outdoor shopping center. This area has had quite a few places open and close which is a bit odd since Kenwood Mall has so much traffic. Their menu has the classic Red pizzas, a few White pizzas, build your own, salads as well as sides, sweets and drinks. They also have a nutrition pdf for their menu - but it doesn't include allergens. You order your pizza and they cook it for just 2 minutes in the 900 degree oven. I got the Sausage & Broccolini White Pizza ($7.25) with mozzarella, sausage, broccolini, garlic and chili flakes. Their pizzas are all one size and could easily be shared - especially if you got something else with it. If you're not familiar - the white pizza basically has olive oil instead of a red sauce. I get acid reflux pretty easily so I try and avoid red sauces for the most part. Now the pizza - it was fine. I love broccolini so I was really looking forward to it. I guess it was just a bit bland. The crust is very light and crispy and the ingredients are high quality - but overall - it was just ok. I also ordered the Prosciutto appetizer ($3.50) - there wasn't much of a description - but I love prosciutto so I went with it. The price is good - but I didn't love it - as a whole. The prosciutto was fine - nothing wrong with it - served 5-6 slices and they were tasty. But they were served with a couple of pieces of thick pizza crust. Prosciutto is very delicate - it's a thinly sliced dry-cured ham - my favorite way to have it is wrapped around fresh pear or melon. To serve it with a big chunk of bread is just not a good match. Lastly we tried the Budino ($1.50) which is butterscotch pudding topped with caramel and chocolate. They gave this to us free of charge when we ordered. I have a feeling they had extras and just didn't want to waste them - which was fine by us. This was the highlight of the meal - it was DELICIOUS!! And only $1.50! Hell - I would go back just for this! Why Should You Go? Well - the pizza was fine. It's a bright, open restaurant with quick food and solid ingredients. Would I go out of the way for it? No...except for that Budino!